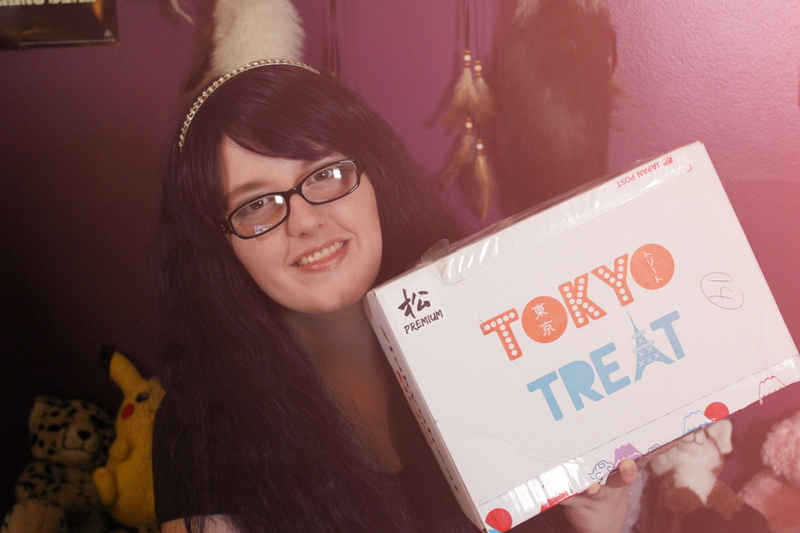 Yay, I’m so excited to be sharing with you guys my experience with the awesome Tokyo Treat! Tokyo Treat is an awesome Japan-based, monthly subscription box that has authentic Japanese candy! Tokyo Treat comes in three different sizes. Small, which is $14.99 per month, and then Regular at $24.99 a month, and finally Premium (which is what I will be sharing with you all) at $34.99 a month! Premium contains all the items Regular has plus more, and Regular contains all the items small has plus more. It really awesome to see these candies, and I am more than stoked to show you all! If you’re still reading this, or you just want to see the photos, then you’re in the right place. Onward, to the unboxing images! The first thing that was on the very top of my box was the amazing list of all of the products inside. On the other side (which can be seen in the image above) shows a cute, minimalist-type design along with the month this box is for, as well as the company name, Tokyo Treat! Digging into the box, this item is called Meiji’s Curry Curls. Tokyo Treat describes this as “puffed and crispy treats flavored with the delicious spices of Japanese curry”. Yum! Next was this Pretz box! At first I thought perhaps it was going to be pocky, but I was pleasantly surprised! Thos is called Gilco’s Pretz Mild Salad. Tokyo Treats writes, that this is “delicious salad-flavored biscuits”. I tried one out, and this is definitely a unique taste that I wasn’t familiar with! Despite not being familiar with it, I thoroughly enjoyed it! I absolutely adore the packaging of this treat! It’s super “kawaii”! This one is another from the brand Gilco, which I automatically recognized. This one is titled, Gilco’s Capri Cocotte Strawberry & Vanilla. About this particular treat, Tokyo Treat writes, “This sweet and airy chocolate will leave you speechless and longing for more!” Ooooh, lala! The next thing I pull from my box is this package! This one is called “Assassination Classroom” Sugar Cola Flavor Chewy Candy. Assassination Classroom?! Ack, sounds dangerous! Rest assured, friends, Tokyo Treat wrote, “This number one manga collection series, ‘Weekly Shonen Jump’ and their particular Manga ‘Assassination Classroom’ collaborated to make a sweet and chewy candy!”. Phew, that scared me! This piece is super cute, too! The drawing on the front is sooo cute! This is called Yaokin Rice Cracker. Tokyo Treat writes, “This special rice cracker has a very important place in Japanese history. Yyou can see this style of cracker often available in the food stalls at various Japanese festivals, both past and present”. WOW, cool! This one was a bit weird for me, but it’s all about learning new tastes, right? This one is called Gummy Maru Takeshi Grilled Egg, and Tokyo Treat writes, “Tamagoyaki (grilled egg) flavors combine to give you a feeling of ancient Japan while you are snacking”. Hmm, interesting! I gotta say, I was immediately pulled into this one’s packaging and tried it right on the spot. And it was so good. I absolutely adored this candy, and it’s extremely beautiful, too! This one is called 12 grans LOOK (harvest la mode fruitful), and Tokyo Treat writes about this one, “These candies come from four different types of flavors and 12 grains from Japanese farmlands that you know you can enjoy.” Definitely cool! ALERT ALERT! MY FAVORITE! MY FAVORITE! (Well, one of my many favorites). It’s a DIY candy kit! Eeep! This one in particular is called, Kracie’s Fun Ramen Shop, and Tokyo Treat writes about this, “Make your own delicious candy ramen at home. Only water is needed to make the delicious ramen and dumpling looking meal”, woo this is awesome! I can’t wait to give this a go! ANOTHER ALERT! ANOTHER DIY CANDY KIT! This one is marked as “special” on the list Tokyo Treat provides, so this is the special product in the November premium box, woohoo! This one is called Meiji’s Mushroom Mountain DIY Snacks and they write, “This special do-it-yourself candy kit is our signature snack of the month. Enjoy making special mushrooms on an enchanted mountain for you!” Ahh, I can’t wait to try this! Why can’t America have these things?! These ones are super cute, and I love the unique packaging of each! These ones are called Umai-Bou 3 Set and written about these is, “a small, puffed, cylindrical corn snack … saly and crispy in texture”. Mmm, sounds so good! AAHH!! PIKACHU!! This one is called East Pigeon Pokemon Milk Snack and Tokyo Treat writes, “This popular cracker snack is now in the form of Pokemon’s renowned Pikachu character. These corn-puffed treats are crunchy and delicious and we think you will absolutely love them!”. Ah, so sweet! I love how the packaging of this box is also in the shape of a pokeball! How cool! Okay, so this packaging is definitely unique. It’s in a pyramid shape, which is super inventive! This is called Sato Petite Pack of Meiji Bamboo Shoots, and Tokyo Treat wrote, “This adorable triangular pack of mini cookies will leave you wanting more … the basic flavors you know well of chocolate and cookie are combined to make a sensational treat at any time of day or night”. Yummy! I also got a drink! This one is titled Chilled Candy (Ginger and Honey) and says, “This delicious drink mimics the idea of drinking rain because of how connected to nature it is. Enjoy the flavors of ginger and honey that will deeply soothe your throat.” UM, HOLD ON. RAIN?! That’s super cool. I love the design of this can as well! Super cute and super nice design. Part of me wants to put this on the shelf, and part of me wants to drink this at once! I’m having such a dilemma! Next is this cute, blue cup thing. Hmm, I wonder what it is? This one is called Doraemon’s Cup Chocolate and is “from the well known character in Japan known as Doraemon, comes this easily portable cup full of chocolate-dipped nugget snacks”. Ooooo, yummy! Disclaimer, I totally tried these… and I totally loved them! Last but not least is this Kyooya Cherry Rice Cake and it is a “cherry rice cake treat that is both starchy and sweet!”. Oooo, sounds fun! Okay, so that’s it for my unboxing! Thank you all for reading, and let me know what you think down in the comments! Don’t forget to visit Tokyo Treat for yourself: https://www.tokyotreat.com/ ! Previous #BYBB Unboxing, Review, & Makeup Tutorial! Next UNBOXING: Book Case Club!